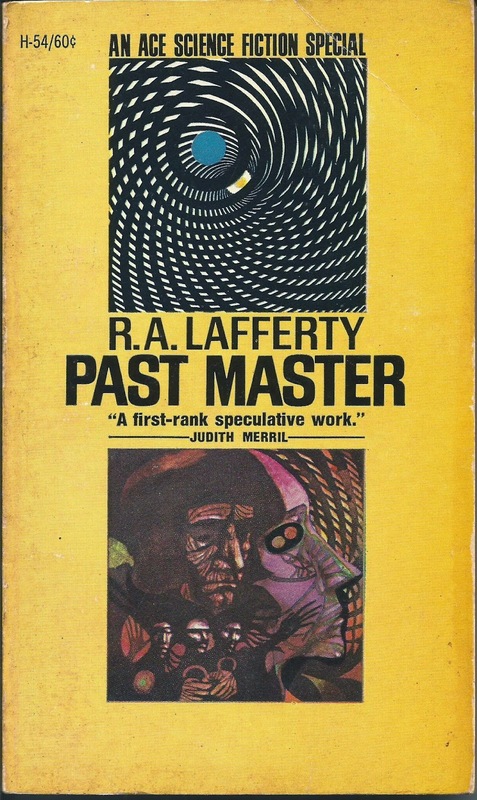 As I admitted in the comments to my blog post about Utopia, the main reason I read Thomas More’s famous work at this time was as preparation for reading R. A. Lafferty’s first published novel, Past Master, which I purchased in late November along with some other Lafferty paperbacks. 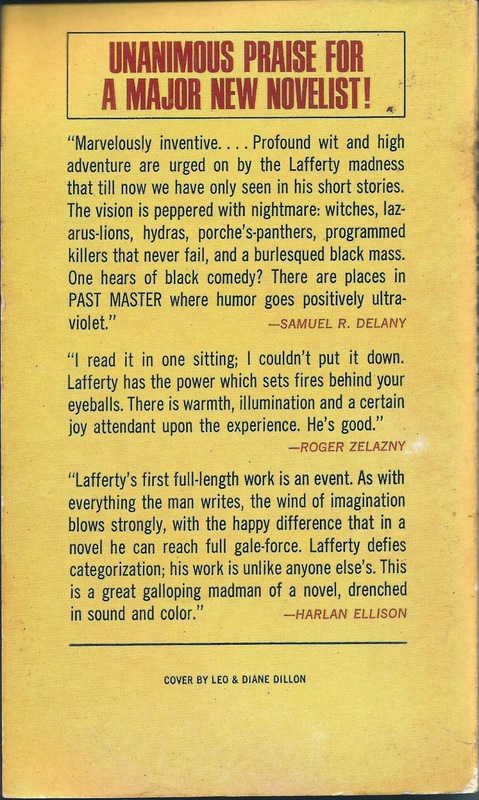 The back cover of my copy of Past Master, the 1968 Ace Science Fiction Special, includes lengthy and detailed praise for the novel from people much smarter and more successful than I am. Praise for Lafferty and this book, we are told, is unanimous! Dare I buck the trend? Luckily, I need not dare; the book is good! Almost every page of Past Master confronts the reader with a bewildering mystery, a strange oddity or a striking image, and I enjoyed it. The praise is still unanimous! It is the 26th century. Humanity has colonized several planets, but by far the most populous and prominent, in fact overshadowing Earth, is Astrobe. The novel begins in a building on Astrobe that is under attack by “mechanical killers” with “ogre faces.” Taking cover inside the building are three men, the three leaders of Astrobe: Cosmos Kingmaker, the wealthiest man on Astrobe, Peter Procter, the luckiest, and Fabian Foreman, the smartest. Each of these three men believes he is the true ruler, and is manipulating the other two. The mechanical killers have come to destroy Foreman; their mind scanners can detect doubts about "the Astrobe Dream," the ruling ideology of the planet, and Foreman is going through a period of skepticism about how things on Astrobe are run. He knows a secret way out of the building, but before he flees the three leaders most come to an important decision. Astrobe, described by Kingmaker as “the last chance of mankind,” is in jeopardy, and a man must be found who can lead Astrobe out of these troubles, or at least serve as the public face of the ruling clique as they strive to solve the crisis. It is decided to send an agent back to Earth and back through time to enlist a great man from history for this task, and the man they settle on is Thomas More, the English lawyer and Catholic saint, opponent of the Protestant Reformation and author of Utopia. The agent is a man called Paul, a man experienced in dealing with danger, who is pursued by the same types of mechanical killers that are after Foreman. He fights and connives his way to a space ship and to Earth, which is 1.5 parsecs away. In one month the Hopp-Equation Drive on Paul's ship can propel a space ship 1.5 parsecs, a distance it takes light five years to cross, but such travel has unnerving side effects. For one thing, travelers are subject to “reversals;” during the voyage men become women, right-handers become left-handers. Space travelers also experience as much psychic activity in that one month as they would normally experience in five years. This manifests itself in thousands of vivid dreams, one following after the other. These dreams can be symbolic and even precognitive. Lafferty’s version of Thomas More is a charming character who, when brought forward in time one thousand years, embraces tobacco and mystery and science fiction novels, and asks Paul if the fishing is good on Astrobe. He tells Paul that he has been visited by time travelers before, and expresses dismay that so many people have seen Utopia as a blueprint for an ideal civilization when in fact he meant it as a satire and a warning of the kind of sick society he feared would result if trends he detected in early 16th century Europe were allowed to continue. After landing on Astrobe Paul and More fight their way through their mysterious enemies, aided by equally bizarre allies, to safety. More is enthusiastically welcomed by the ruling class of Astrobe and begins to investigate the mysteries presented by the planet to him and by the novel to the reader. Life is easy in the well-organized cities of Astrobe, where poverty and illness have been eliminated, along with individuality. (The Astrobe Dream holds that a society is like a body, and all the citizens have to work together the way all the cells of a body work together. Following this analogy, an individual is like a cancer.) What exactly is the crisis that is threatening Astrobe? Is it the high suicide rate? The fact that a large proportion of the population has lost faith in the ideology of Astrobe and gone to live in reeking unhealthy slums or wild feral areas where they are in danger from ravenous monsters? Or is it Ouden, a sentient celestial nothingness worshipped as a god by the artificial people of Astrobe, who wishes to extend his dominion to include the natural old-fashioned humans? The climax of the novel comes when More, performing the duties of a rubberstamp president, refuses to rubberstamp a single piece of legislation, one outlawing belief in God. More is sentenced to death, and his public execution inspires an upsurge of feeling among the citizens of the perfect cities and an attack by an army from the slums. Lafferty compares the death of Thomas More in the year 2535 with such epoch-marking incidents as the fall of the Roman Republic, the Protestant Reformation, the discovery of America, and the birth of Jesus. A new age is dawning, an old world is dying and a new world being born. Whether this new age will be better than the old Lafferty does not say, but he says we can and should hope. This is a dense novel, full of strange characters with weird powers and mysterious agendas, dreadful fights, and allusions to religious and political topics, and sprinkled with bizarre dreams and tall tales. More himself, rather than some stalwart exemplar, is a complex, shifting figure whose faith in Christianity comes and goes, and whose allegiance and objectives change back and forth. Lafferty is no doubt opposed to the atheistic and tyrannical Astrobe dream, but admits that the idea of a perfectly planned, perfectly easy life can be very attractive, so seductive that a man as wise as More might fall for it. But a life that is too easy is not worth living; the people of Astrobe are committing suicide by the millions and abandoning in droves the perfectly organized cities because a life without challenge or struggle is not a life at all. Lafferty doesn't use words like "socialism" or "collectivism" or "communism," but I still think it is fair to see the book as, in part, a (hostile) commentary on socialism and an expansive welfare state. Lafferty employs one of the traditional criticisms of socialism, that it requires a brutally repressive enforcement apparatus that polices people's very thoughts, but I think it is interesting that he abandons one of the other traditional attacks on socialism, that the lack of property and price signals would lead to inefficiencies and poverty. Instead, Lafferty suggests that even if socialism succeeds on its own terms and produces plenty for all, that it is inhuman and soul destroying. Multitudes of people on Astrobe freely choose to work dangerous jobs in a polluted slum rather than live a life of total ease and absolute comfort in the shining cities. Machines and artificial people (Lafferty never says "robots") are very important to the novel. It is these machines, which can do all the boring or dangerous jobs as well as read and even manipulate minds, which make the efficient Astrobe economy and oppressive Astrobe police state possible. The sympathy More feels for the Astrobe Dream is partly or wholly due to psychic probes, sent by the nihilistic leaders of the artificial people, which put thoughts into More's head as well as words into his mouth. (When More is aware of these probes he calls them "snakes.") Past Master may be as much a criticism of technology as it is of government intervention into private and economic life; when men become too reliant on soulless machines, Lafferty suggests, men lose their souls and become mere machines themselves. Highly recommended to fans of literary science fiction and to classic SF fans curious to read something new and different but made up of so many of those classic SF elements we all love, like space travel, time travel, oppressive governments, telepathy, robots, aliens, monsters and wars. If you are interested in Lafferty and SF that is a little off the beaten path you should definitely check out valued commenter Kevin's great blog, Yet Another Lafferty Blog. Envy his Lafferty collection! Excellent review of Past Master! Thank you for posting this. When you drew the analogy between people in Astrobean (Utopian) society and the cells of a body, you reminded me of one of the key concepts in another of my favorite books, The Dispossessed by Ursula K. LeGuin. The Dispossessed is also about an attempt to create a collectivist Utopian society. One of the key concepts of this imagined society is to compare the individual to a cell in a body and examine the individual's drive to discover one's "cellular function"--that function in society for which you are best suited or most specialized. By embracing one's individual traits and proclivities, one can do the work that most fits one as an individual, and society will function organically. Lafferty takes a similar concept and views it from the exact opposite function--saying (effectively, because he doesn't use the same metaphor) that for people to function as nothing more than cells in a body, they have to be controlled by an overarching consciousness and thereby forfeit their own individuality and consciousness. Where LeGuin sees a positive outcome of the cellular metaphor, Lafferty sees it as the death of individuality. I have always though a great comparison could be made of those two books. They both look at a Utopian ideal for a fictional society, examine the benefits and flaws, and arrive at opposite conclusions. And Lafferty has a whole lot of fun on the way. Sounds like I better start reading Lafferty. This in particular sounds interesting. I think Past Master would be a good first Lafferty, as it is not quite so far out there as the others I have read. Excellent review. I'm now an enthusiastic follower of your blog. Thanks for the kind words. I'm glad you like the blog! Hi again, I am the editor of a semiannual Lafferty Fanzine, Feast of Laughter. We publish twice a year in November and March. Our focus is Lafferty scholarship and essays, reviews, original works inspired by Lafferty, and when when we can obtain reprint rights, a Lafferty story in each issue. In our first two issues, we have had stories and essays by Howard Waldrop, Michael Bishop, Michael Swanwick, Darrell Schweitzer, Stephen Case, and many many others. I would love to include your reviews of Utopia and Past Master in our upcoming issue in November, 2015. May we have permission to reprint them? I would also love it if you would like to write something original for the magazine.